Combine the chicken, lime juice, cilantro, garlic, sugar, soy sauce, pepper and mint in a plastic, re-sealable food storage bag and seal. Shake to combine, then transfer chicken to the refrigerator and allow to marinate for 24 hours. Remove the chicken from the refrigerator and discard marinade. Allow chicken to come to room temperature for 20 minutes. When the grill is hot, grill the chicken breasts, turning to mark on both sides, until an internal temperature of 165 degrees F, about 8 to 10 minutes, depending on your grill. Remove from the grill and allow to rest briefly before carving each portion into thin slices. When ready to serve, place 2 lettuce leaves on each of 4 plates, and fan the chicken slices on top of the lettuce leaves. 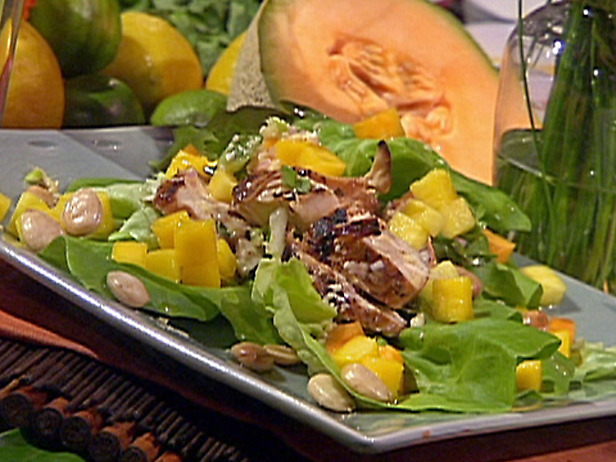 Garnish each plate with 1 1/2 ounces of the mango, 1 1/2 ounces of the papaya, 1 1/2 ounces of the pineapple and 5 marcona almonds. Drizzle 2 tablespoons of the Lemon-Ginger Vinaigrette over each salad and serve immediately. Combine all ingredients in a nonreactive container with a tight fitting lid, cover, and shake to combine. Serve immediately or refrigerate for up to 2 days before serving. Mix the vinegar, lemon juice, honey, and salt in a blender. With the machine running, gradually blend in the oil. Season the vinaigrette with salt and pepper, to taste. In a large bowl, combine corn, peppers, celery, garbanzo beans, peas and green onions and toss gently. Mix mayonnaise, lemon juice, garlic and garlic powder and oregano in a small bowl. Add to bean mixture and toss gently. Season with salt and pepper. Cover and refrigerate until well chilled, about 1 hour. Sprinkle cumin over salad. Serve. Makes about 12 cups. Thank you for reading my blog, I hope you like this post. I love salads, summer and grilling! If you have any recipes you think I should try, please let me know. I think food brings people together, my hope is to make healthy food and lots of friends! Enjoy your holiday week and let me know if you make any of these salads. 4th of July is a great time to bust out a new salad recipe! Last night we made the Neely’s Lemon Pasta Salad…yum!! Click on the follow button if you like our blog! We love hearing from you thank you for your comments. We are nothing without all of you!